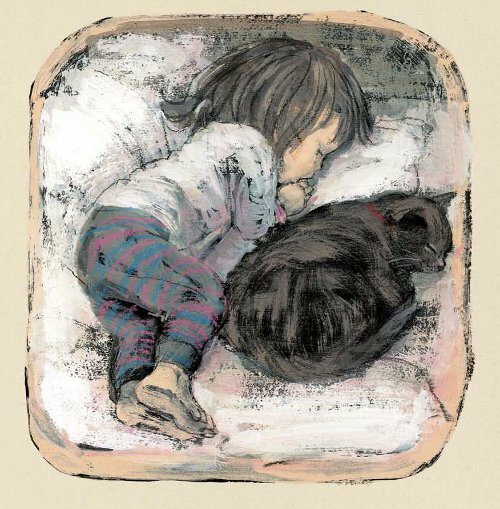 If someone were to ask me who some of my favorite author-illustrators for very young children are—those who make books, that is, geared at preschool readers—I’d say that Komako Sakai is most assuredly one of the names at the top of that list. 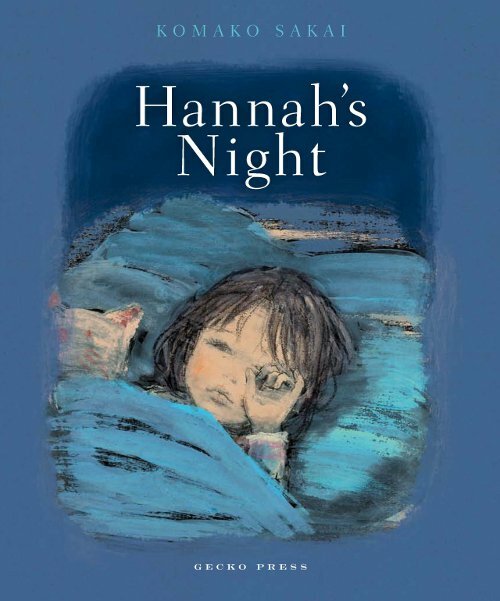 This month, Gecko Press released the first American edition of Sakai’s Hannah’s Night, which was first published in Japan in 2012. 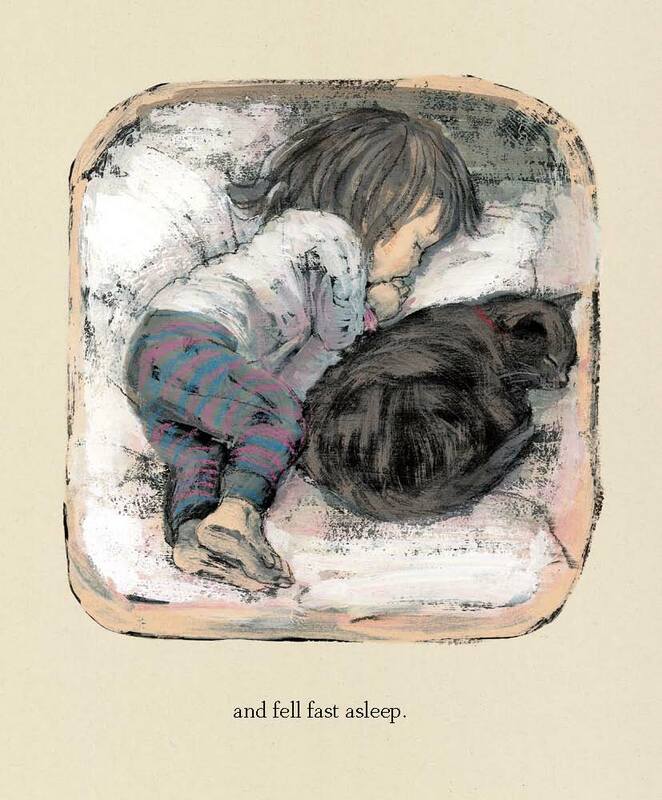 It’s the story of a very young child, who wakes at night and, after failing to wake her sister, explores her home with her cat, Shiro. There’s mystery and wide-eyed wonder (the dark house at night) and mischief here (Hannah giggles as she takes her sister’s music box, notebook, and coloring pencils back to her own bed to play with), and the youngest of readers will thrill at Hannah’s free reign of the home, independent of any grown-ups telling her what or what not to do. There are moments of beauty, too, such as when Hannah hears cooing and heads to the window to see the “prettiest dove she’d ever seen,” something she’s not likely to see during the hustle and bustle of her day. 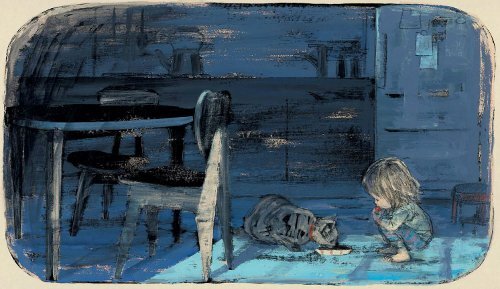 Sakai’s thick brushstrokes bring a vibrant texture to the story, and I’m enamored with the dark, navy blues of Hannah’s world at night. These are deep, rich shades, made all the more striking when the sun starts to come up — just as Hannah finally gets sleepy. 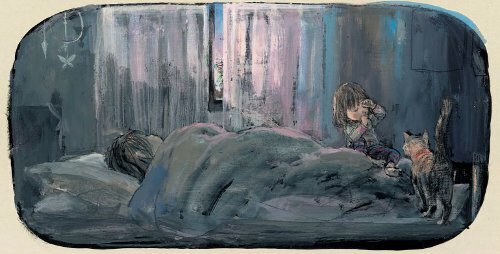 “…but her sister was fast asleep. HANNAH’S NIGHT. Copyright © 2012 by Komako Sakai. First published in the U.S. in 2014 by Gecko Press. Spreads reproduced by permission of the publisher. 1) I listened to this CD about five times this week right there at that NPR link. It’s really good, and I see a CD purchase in my future. Pretty soon it will no longer be playing there, but I think the link still works today. 2) Later this month, I’ll see those same musicians open for Shovels & Rope. It’s gonna be a good, warm, foot-stomping show in cold, cold February. 3) Speaking of foot-stomping, the Saintseneca song, the first one on this list, makes me happy. I once saw him sing that live (with just one sibling), and it was pretty much five minutes of transcendent beauty. 7) This week, I re-discovered my love for the song “Evensong” by The Innocence Mission. (The song is from 1991.) See the lyrics? I love them so. 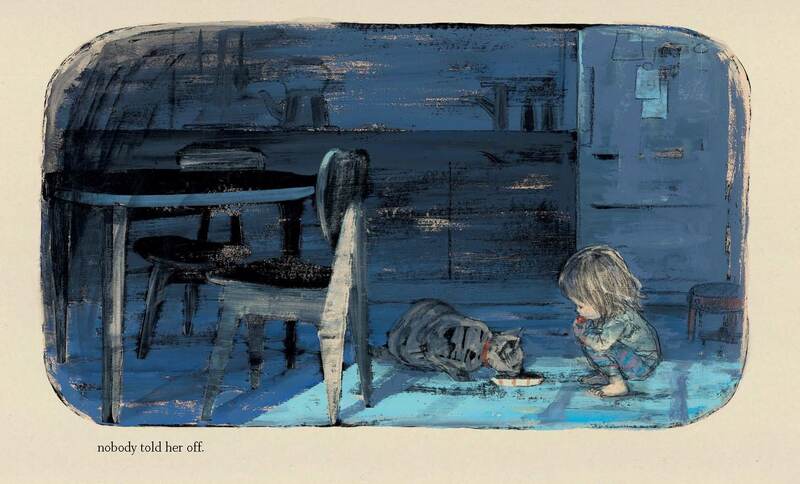 Jules- If there was ever a reminder that I want to be back at 7-Imp it was the dream I had last night. I was at our favorite book store and when I rounded the corner- there you were!! And you had your girls with you too. It was awesome! 1. The baby girl curled up with her cat in the pictures above. Love!! 2. A chance to see one of my favorite authors, Kelly Corrigan, in person this upcoming week. 4. The potential for a week free from snow days (knock on wood!). 5. Haagen Dazs vanilla chip ice cream. 6. Our fluffy dog running in the snow. 7. Being back at 7 Imp! Komako’s pictures are lovely. I’m going to have to get my hands on this one. As a night owl myself, I love the blue quiet of the house when everyone is asleep. Jules – So many kicky, stompy, awesome links thanks for sharing. Keep rockin’ those piano lessons. Stacey – Welcome back! It’s been a while since we’ve had a week without snow days. Here’s hoping. Jone – I’ll say, “Hi” now since you are always typing at the same time as me. 1. My new postcards and business cards arrived. 2. Saw the Lego Movie, fun. I mean, awesome. 3. Getting excited for my trip to NY. I won’t be attending the SCBWI Conference, but I’m hoping to connect with some kidlit friends. I am looking forward to some museum time, drawing time, eating time without the obligations of a conference or a family visit. 4. Got new glasses, still getting used to them. 6. Hanging with my Book Club friends. 7. Having vague New Year’s Resolutions this year is working out great, so far. Hannah’s Night looks like total fun. 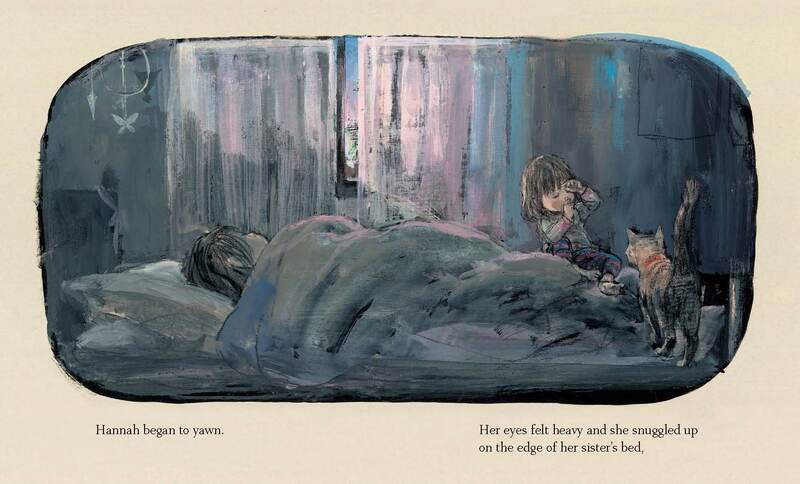 The illustrations capture that at night roaming around. Thanks for sharing, Jules. Jules, I now have “Rainbow Connection” in my ear with frogs. Stacey, welcome back, yay for dreams. Moira, very funny! I’m later today, Internet was funky. Enjoy NYC. 3. Getting home safe and sound on Thursday. 5. CYBILS deliberations. The winner announce on Friday. 6. Finished reading Flora and Ulysses. 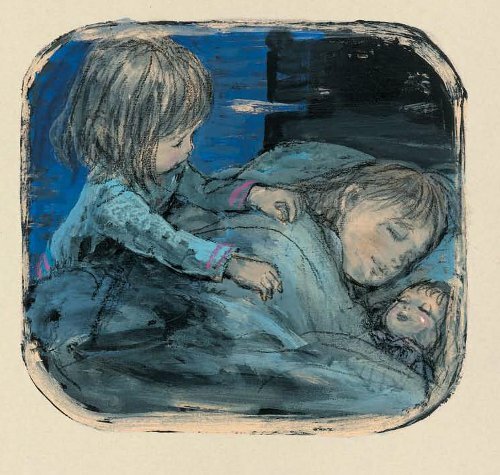 I think the artwork of Komako Sakai is absolutely precious; the lines and colors truly convey the emotion of the story. Jules: I hope I get to hear you play piano some day. I like the switching your instructor is having you do. Moon River is a favorite. Jone: Isn’t Flora & Ulysses the best? I can’t wait to see the CYBILS winners. 2. Finding someone to paint my bathroom. Wishing you all a fantastic week. 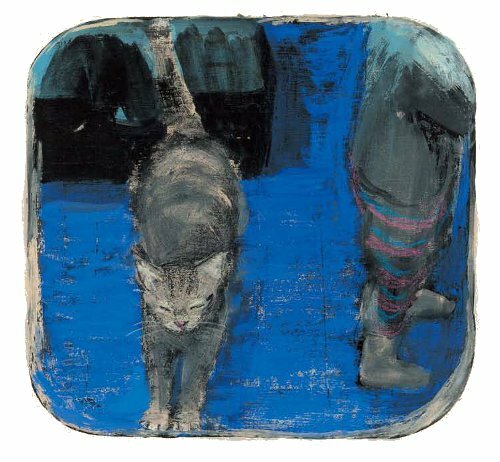 I was delighted to be greeted by a cat illustration first thing. Hello, kitty – Shiro – and hello, Komako Sakai – and Hannah! Jules: That sounds like a fun playlist for your piano lessons. Have we discussed Breakfast at Tiffany’s: original short story vs. movie? Because we can, if you’d like. Also, Muppet-wise, Kermit is adorable. My favorite bit related to Kermit is the sketch in the T-shirt shop. I’d link it, but I know the dingos would eat my post, so just go to YouTube and search for Kermit (or Muppets) coupled with the phrase “The Wonderful World of T-Shirts.” It’s the best. I love anagrams. As for the other songs/videos you listed and linked, I will check them out later. I am currently listening to Katy B, who is in a different genre (more electronic/dance, but also pop, and some ballads) those artists you posted. Stacey: Enjoy your week, with its visits, sun, snow, and pup! Vanilla ice cream is delicious. I haven’t had that exact kind you mentioned. Moira: Your business cards and postcards look SO GOOD! Kudos! Have fun and be safe on your travels. Also, y’all, I posted two fun author interviews, updated booklists, and more in recent days at Bildungsroman, so I hope you’ll check them out! OH, I adore that first painting. A little impressionist; a little starry night in the background; and a sweet grey kitty like my Sophie? All my favorite things! Stacey, I totally agree about being back at 7 Imp! Moira, I want to see the Lego Movie! 2) Co-authoring a chapter on using picture books in the classroom – fingers crossed that the editors like it. 4) Anticipating Valentine’s Day plans & an upcoming long weekend with our college friends – I love February! 6) my practicum with the Center for Children’s & Young Adult Literature – opening boxes of new books=Christmas every week! What a gorgeous color palette! 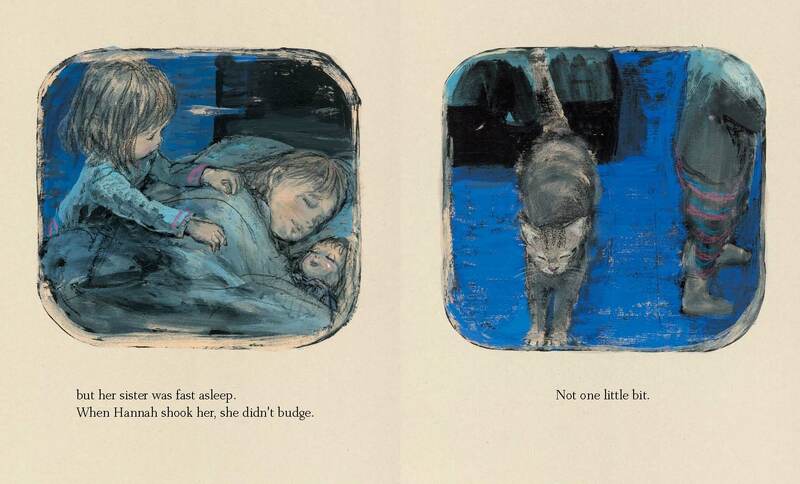 Especially love the last illustration of Hannah finally getting sleepy. Jules – sounds like you’re rockin those piano lessons. Moon River is a fave of mine as well. Will check the music links later. Stacey – sunshine and dogs running in snow are the best. Moira – congrats on the postcards and business cards. Looking forward to the Lego Movie. Margie – stay warm on those snowy walks with Xena. LW – sounds like a busy-but-normal week for you. Will check out your new additions later as well. Shannon – Hooray for kick#1! Dresses and cowboy boots are a great combination. 2) Fire in the fireplace. 5) Finished Plum and Jaggers, by Susan Richards Shreve, and really liked it. 7) Walks in the snow, then getting home where its warm. Margie, kick number 3…except we have no sun here. LW, I will personally high five my drama kids for you! Shannon, love your number one kick. Rachel, we walked to Burgerville (local fresh burger place) to get out of the house. Jone, I love snow days! What did you think of Flora & Ulysses? Margie, What did you think of Paperboy? We were so thrilled to have him speak here in Knoxville on the day that he received the Newbery honor! And I love the imagery of the snow becoming diamonds. LW, Wow you had a productive week! I can’t wait to check it out. Rachel, I love fires in the fireplace and hot chocolate! Shannon and Margie, I thought Flora and Ulysses will be a story that students will love. Di Camillo doesn’t miss when she writes. She knows kids. Komako Sakai’s artwork is absolutely stunning. I’m speechless and wanting to live in that beautiful blue world. Everyone! I’ll be back in the morning, first thing. Promise. The day got away from me, and I want to respond when I’m fully, FULLY awake and have coffee in hand. Thanks, as always, for kickin’ with me. Stacey, I like that we were in your dreams and that we were at a bookstore! Hope you get your snow-day-free week. Moira: I have only heard wonderful things about that LEGO movie. … Your last kick made me laugh. Jone: You all got a snow day? Isn’t that rare in really snowy places? Must have been a big snow. Margie: I cannot. even. imagine. that. much. snow. …. I wanna read Paperboy. Thanks for reminding me. Little Willow: I love your 4th kick. That’s optimism right there. And, yes, I’ll do that Kermit video search. Shannon, love your sixth kick, because I love the CCYAL! Also, congrats again on the book! Rachel: Ah, work being cancelled and just staying home to read. I need to finaigle (sp?) a day like that for myself. So glad you got that. Love the colors and mood of these beautiful pictures. A precious peepole into a tiny person’s private nighttime world.